А вы говорите Кончита …. Как сообщил зловредный голос BBC – 10 лет назад, 12 мая 2004 года в Англиканской церкви была введена должность веб-священника, в обязанности которого входит опека нового прихода, который существует исключительно в сети. Элисон Лесли, действующему женщине-священнику, было поручено опекать интернет-церковь, общину верующих со всего мира. «Это люди, которые будут совместно молиться в чатах, совершать веб-мессы и заниматься общественной деятельностью посредством электронной почты» , а в Туёй Америке разгул демократии дошёл до того, что последователи пастафарианской церкви (the Church of the Flying Spaghetti Monster, если я правильно перевожу наше название энтой церкви) присегают при вступлении в должность с друшлаком на голове, а вы говорите Кончита …. A unique style of headwear was present during newly-seated Pomfret Town Council member Christopher Schaeffer's oath of office Thursday afternoon, but it wasn't intended to keep his head warm. 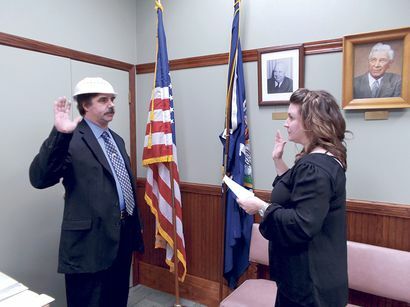 Schaeffer wore a colander (a strainer typically used to drain water from spaghetti) while Town Clerk Allison Dispense administered the oath of office to him before the board's reorganizational meeting. When the OBSERVER asked afterward why he wore a colander on his head, Schaeffer said he was a minister with an even more unique organization - the Church of the Flying Spaghetti Monster. "It's just a statement about religious freedom," he said. "It's a religion without any dogma." Newly-seated Pomfret Town Council member Christopher Schaeffer (left) recites the oath of office read to him by Town Clerk Allison Dispense. Schaeffer wore a colander, which is associated with a unique religious movement called the Church of the Flying Spaghetti Monster. A dogma is a set of principles laid down by an authority as truth, such as the doctrine of an organized religion. Schaeffer directed the OBSERVER to the church's official website for additional information on the topic. According to the website, the church came into the mainstream in 2005. "Our ideal is to scrutinize ideas and actions, but ignore general labels," the website states. "Some claim that the church is purely a thought experiment, satire, illustrating that Intelligent Design is not science, but rather a pseudoscience manufactured by Christians to push Creationism (the doctrine that God created the universe) into public schools. These people are mistaken. The Church of FSM is real, totally legit, and backed by hard science. Anything that comes across as humor or satire is purely coincidental." The group has become an international movement and is widely recognized in the media as poking fun at organized religion. Many followers oppose the teaching of Intelligent Design and Creationism in public schools. Schaeffer explained a group of church members in Russia, called Pastafarians, were arrested during a parade last summer and charged with organizing an unsanctioned rally because they "offended the Orthodox Church." "Somebody called the cops, and the cops came and arrested them," he added. "Most of us do not believe a religion - Christianity, Islam, Pastafarianism - requires literal belief in order to provide spiritual enlightenment," the church's website states. "That is, we can be part of a community without becoming indoctrinated. There are many levels of belief." While colanders may or may not reappear in the future on the Pomfret Town Board, Schaeffer said he is committed to working for the residents of the town of Pomfret. "Mostly, I'm just looking forward to making sure that the town is run smoothly and we meet the needs of all of our citizens," he said. "If anybody ever has any concerns or questions, I hope they contact me, because I want to make sure that everyone is represented." И куда спрашивается Опус Деи с Хоругвиеносцами смотрят?